We all have to admit that just reading scriptures is not always fun and interesting. Kids can find it hard to understand and not very descriptive, so ultimately it can be boring. 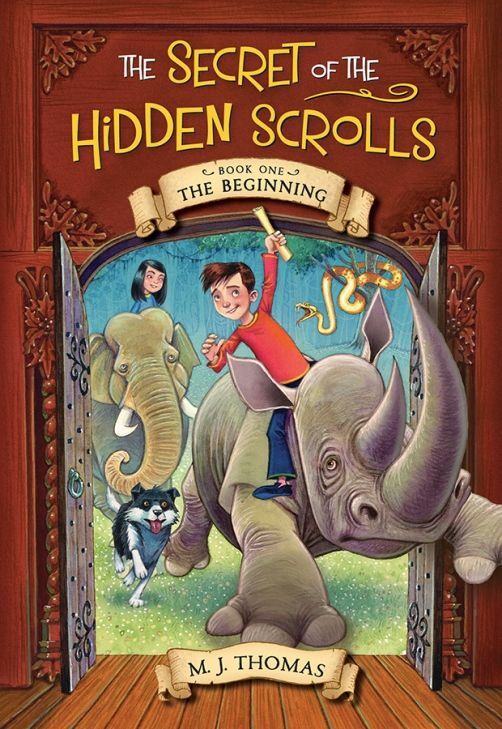 Well Worthy Kids/Ideals has a new series released by M.J. Thomas called The Secret of the Hidden Scrolls, and we got a chance to review The Secret of the Hidden Scrolls Book 1 - The Beginning and The Secret of the Hidden Scrolls Book 2 - Race to the Ark. Created for elementary reading level, about ages 6 - 9, The Secret of the Hidden Scrolls series brings Bible stories to life. This Christian children's series places your children in the Biblical events in a fun, and un-scary way. You are introduced to brother and sister, Peter and Mary and their dog Hank. While staying with their Great-Uncle Solomon, he introduces them to one his greatest discoveries as an archaeologist. He found Ancient Scrolls that were part of The Legend of the Hidden Scrolls. That night Peter and Mary accidentally are transported away to what is a dark world. It turns out that they land in the time of the Creation of the World. The meet up with Michael, an angel during their journey. He gives them the rules for their adventure. He says they have seven days to solve the secret of the scroll they are holding or they have to remain where they are forever. The trouble is the scroll is written in Hebrew. Each chapter brings a new Day of Creation. Throughout the story, Micheal gives the children hints about the scroll they need to be decoding. During their adventures the kids learn what it may have been like during the Days of Creation. Will they be able to decode the scroll? Or will they be stuck in the Garden of Eden? 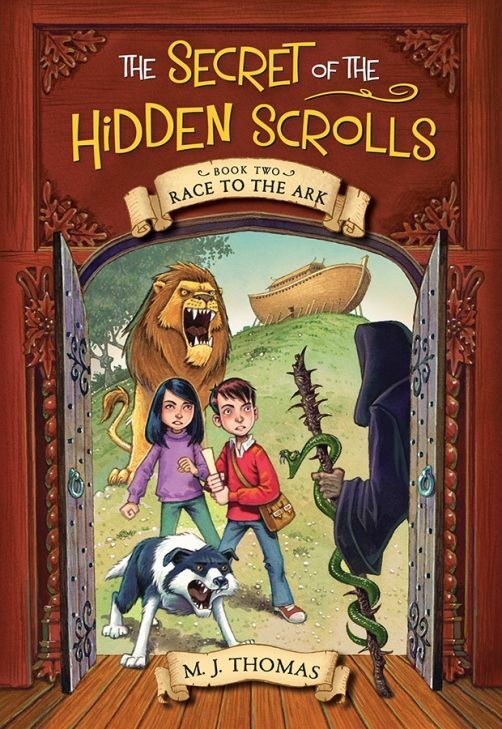 In the Second Book - The Secret of the Hidden Scrolls Book 2 - Race to the Ark ($6.99). We are back with Peter, Mary and Hank in a new adventure. The kids are still staying with Great-Uncle Solomon and he still has no television. They discover Great-Uncle Solomon's archaeology tools and even his journal he was keeping when he discovered the ancient scrolls. Then the kids suddenly hear the familiar Roar, which signals the start of their next adventure. The world that Peter, Mary and Hank drop into is much different world than in Book 1. They see a city. The kids enter and discover some pretty bad attitudes among the people, even encouragement to lie, cheat and steal. They are told the Dark Ruler allows them to do anything they want. The kids are also told they are not allowed to believe in God. This is very upsetting to them. Michael joins them and helps Peter and Mary as they encounter a group of bullies in the city. As they work at solving yet another riddle with clues on the Ancient Scroll, they meet a faithful family who are not afraid of their belief in God. In fact, they are doing God's will and building a large ark at his direction. Peter encounters the Dark Ruler who tries to convince him that Noah is wrong. Peter soon realizes that the Dark Ruler who is deceiving people is Satan in disguise. He is working hard to turn everyone against God still and he locks the kids up in his dungeon while he goes and tries to turn Noah and his family against God. The kids know that the flood is coming. They keep their faith in God ... but how will they escape? Will the Dark Ruler turn Noah and his family against God too? Well.... you are just going to have to read The Secret of the Hidden Scrolls Book 2 - Race to the Ark to find out the end of the story. The Biblical stories are great. You can use them independently for story time or along with your Bible studies. In fact, we used our copies of The Secret of the Hidden Scrolls during our History lessons, since we are using a Biblically based ancient history curriculum. They worked out well. I recommend you picking your copies up from Worthy Kids/Ideals. We can wait to see what the next adventure will be for Peter, Mary and Hank as they make their way through the Ancient Scrolls. Several members of the Homeschool Review Crew were given the opportunity to review The Secret of the Hidden Scrolls series from Worthy Kids/Ideals. Click on the link below to see what they thought of this literature and how they used them in their homes.